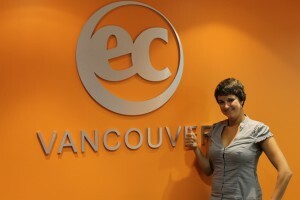 I’ve been working in EC Vancouver since July 24th, but actually I’ve already been here for over 4 months. During these months I went to EC language school and took the CAE course and went traveling. I met lots of cool people and also the nightlife was a great part of this time J After I finished school I went to Hawaii and took a trip through Vancouver Island up to Whitehorse. It was a great time I’ll never forget. So, now I will tell you something about myself. My name is Monika and before I arrived in Vancouver I lived in the middle of Switzerland where I was born, Uri. It’s a small canton which is surrounded by mountains and with a beautiful lake. Some places here in Canada remind me of Switzerland but way bigger. During my 6 weeks at EC School I’ll be working at the front desk meeting and helping you. Also Facebook and Blogging will be an important part while I’m working here. If you have any ideas, pictures or comments don’t be shy and post it on Facebook, or visit me at the front desk and share your thoughts with me. I’m looking forward to meeting you.